JACKSONVILLE, Fla. - Stacey Siddell says she went to the same Jacksonville nail salon she's been going to for years to have her eyebrows waxed. But she says she ended up in the emergency room with third-degree burns. Siddell explained to Channel 4's Jennifer Waugh what happened that day, nearly nine months ago. "It was a little warmer than normal. Normally when they put it on it numbs it a little bit and I didn't think too much of it. It wasn't until the next day that it got bad." Siddell says the area above her eyebrows was red when she left and stayed that way all night... when she woke up- she says blisters started to form where the wax had been. "It was like holes, like red and where the blisters had burst, it was like holes," says Siddell. 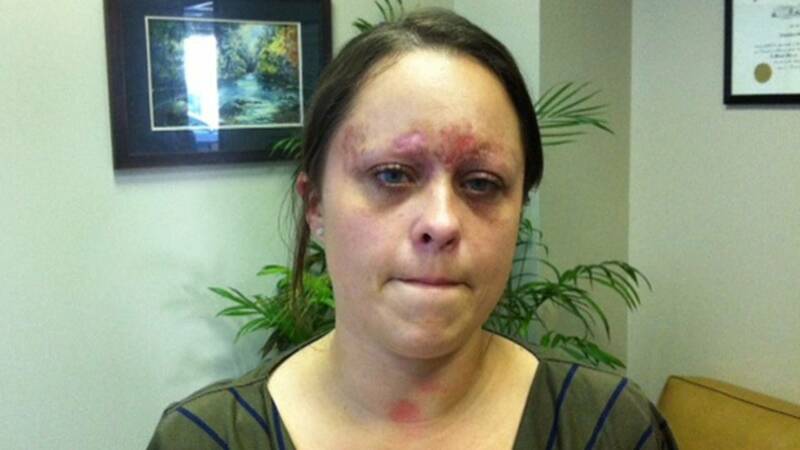 Siddell says she went to the emergency room and was told she had third-degree burns. "It was like when I would wash my face, my eyebrows would just fall out," says Siddell. Then she says she developed a staph infection which infected her entire face. "When the lady had done my eyes she actually used the same stick and they're not supposed to do that. And so when she did it the first time and dipped it back in there, she did it to me. How many other people did she probably do it to that day or how old was the wax. Nobody knows and they think it could have been in that with it being hot wax all the bacteria is just cooking," says Siddell. Siddell says the staph infection led to repeat trips to the emergency room when her eyes would get so swollen she couldn't open them. She says she won't leave the house anymore unless she's going to work, because she says people stare at her. Her co-workers don't because they know what happened to her. Siddell has hired attorney Ten Pina with Nichols and Pina Law and has filed a lawsuit against L & N nail salon on Normandy Boulevard. Pina says there are several things that can go wrong with eyebrow waxings. "Either the temperature wasn't checked, it can be applied without first putting oil on the eyebrows," says Pina. "There's also the possibility that the tech hands were not cleaned and the things she used were not clean since an infection had set in." Waugh went to L&N nail salon to see if the salon knew what happened to Siddell. Waugh: "I need to talk to the owner about what happened to this girl?" Waugh: "This girl right here (showing photo). She got her eyebrows waxed here." L&N employee: "I don't know her." Waugh: "She got 3rd degree burns." L&N employee: "You know I don't know her." Waugh: "Okay, she says she's been getting her eyebrows waxed here since she was 16." The employee Jennifer talked with insisted she didn't recognize the picture we showed her of Siddell with her injuries. She also said she's the only person at the salon who waxes eyebrows. Waugh: "Is this the wax that you use here? And how do you know how hot this wax is? Is there a temperature here?" Waugh: "What do you always leave the temperature on?" L&N employee: "Ah you know it depend on how you see the wax, like, how thin it is, like now you can temperature up." Waugh: "And when you do the eyebrow waxing, do you use this on both of the eyebrows (referencing a wooden stick in her hand)?" L&N employee: "No, when we do one person you can use one." Waugh: "Okay so you use one per person?" You'll remember Siddell told us the woman who applied her wax double dipped. We asked about it, but didn't get a clear answer. Waugh: "If she has something on her skin and you're putting it on her skin and you dip it back in here and then put it on the other eyebrow you could have infected the wax." L&N employee: "No, like, no, no like we never do that." Waugh: "Okay, so how do you do it?" L&N employee: "We put the wax on the eyebrow, like, we do eyebrow for a long time already, we never had problem like that, and the lady I never see her." The employee tells Jennifer there is no credit or debit card receipt indicating Siddell came to this salon last April. Siddell says that's because she paid in cash and it doesn't appear the salon tracks those customers. L&N employee: "I don't see her name. I don't see any like her name in my receipt." Waugh: "Okay, but do you give receipts to those who pay in cash?" L&N employee: "I don't know, no, I never see her come in here, I never see her come in here." The L&N employee we spoke with told Jennifer she is the salon owner's cousin. She would not give Jennifer the owner's number, but Waugh left her contact information and has not heard anything back. In the meantime, the lawsuit against L&N nail salon was filed on Friday. The salon has 20 days to respond in court. We did some background checking on L&N nail salon and the Department of Business and Professional Regulations sent us its inspection reports. An inspector noted in 2007, that the business was not using effective and approved disinfecting methods. Since then, the inspection reports show no sanitation or licensing problems at all. We're also told the salon has not had any violations. Does the technician have a cosmetology or facial specialist license? The state requires it. Is the technician's license posted in the salon with his or her picture next to it? What is used to apply the wax? The salon is required to have plenty available so the same applicator is not used on more than one customer. Ask how the waxing service is done. Make sure there's no double dipping. Keep this in mind: there are no regulatory guidelines that provide any specific requirements for the temperature of wax. So that's up to the nail salon. Pedicures and manicures can pose another potential danger. Nancye Swanson says she nearly died when she caught Hepatitis B, a serious liver infection, where she had her toes done. She contracted the virus outside the state of Florida, but her story is a reminder to everyone, as many salon employees are Vietnamese, who are at a high risk of Hepatitis B.
Swanson says she went to the doctor when her skin started looking yellow. The doctors told her that was a clear sign of Hepatitis B. Swanson says it happened when she was getting a pedicure. "A lot of these places use sharp instruments and they could be re-using those," says Dr. Robert Gish with the Center of Hepatobiliary Disease and Abdominal Transplantation at the University of California, San Diego School of Medicine. Gish is writing a health policy for the Vietnamese Government on the spread of Hepatitis B. Gish says every person born in the Asian Pacific region is at a high risk of already having it. That includes the thousands of people working in salons across the United States. They may not even know they are a carrier. Gish says the problem is that 95 percent of people with Hepatitis B have no symptoms. While there's no cure for Hepatitis B, Swanson is now on a pill once-a-day to control it. Make sure your salon's license is clearly posted. Only disposable files should be used. The pedicure bath and all suction screens in the tubs should be cleaned after each use. That's where deadly bacteria is trapped. Look for labels on products. If you don't see one, they could be diluted. Always take your own polish.